In some cases a Muslim who does not have defined, specific questions about this or that Christian doctrine may nevertheless ask – out of curiosity or personal interest – What is the essence of Christianity? What is its chief characteristic? What is at its heart? This chapter therefore sets out to demonstrate how first Muslims and then also Christians understand what is at the heart of Christianity. 1. Generally speaking, Muslims are deeply convinced that Islam is the last, most perfect and most comprehensive of all revealed religions. Other religions, Judaism and Christianity above all, were valid before Islam but have now been superseded. The true religion is Islam, and only Muslims can be saved. At the same time, Muslims can be quite open towards certain religious values which they meet in the lives of Christians. This, however, only increases their astonishment that people who have encountered Islam, and have even studied it, remain Christians rather than gratefully taking the opportunity to find the fulfilment of all their expectations in Islam, the true and final religion. Muslims might think that it is perhaps an emotional, irrational attachment to Western religion and culture that prevents Christians from being open to Islam. Or are there other motives? 3. Other Muslims again take the view that the perspective on the historical Jesus derived from the work of some biblical scholars is also significant for Muslims, as this perspective calls into question the historical basis of some of the Christian beliefs about Jesus which Muslims do not share. Muslims therefore reject the central doctrines of the Christian faith as misinterpretations of the true message of Jesus. The result of this misinterpretation or corruption (tahr?f), Muslims argue, is the existence of four Gospels (rather than the original one Gospel) in the New Testament available today. (i) Positive. Christianity is a religion of the book, originating from Abraham along with Judaism and Islam. It is a revealed (heavenly) religion. Christians are thus close to Muslims; they are not hostile to them (Quran 5:82). They are believers, and all believers are brothers (49:10). They are monotheists. They pray. They feel responsible for the general welfare of humanity; Christianity demands of its adherents that they show love for the poor. (ii) Negative. Christians are unbelievers (kuff?r) and polytheists (mushrik?n). They worship a human being, Jesus, and make him into a god. They believe in three gods (Mary and Jesus alongside Allah). Their faith is very complicated, while Islam is straightforward. Their Scripture, the Gospel, has been altered and corrupted and no longer exists in its original form. Their religion has been superseded by Islam. The Church and its teaching office have suppressed freedom of thought and condemned science (e.g. the case of Galileo Galilei, 1564-1642). Christians reject Islam and its belief in the radical oneness of God and Muhammad as the last of the prophets. When they pray they do not follow rules; they do not fast. Their religion is onesidedly spiritual and makes unnatural demands such as celibacy; it despises the body and is obsessed with the idea and the omnipresence of sin. 1. The Quran presents two positions which diverge from each other: one praises Christianity while the other is hostile to it. Both tendencies are to be found in Islam, taken as a whole, both in the past and also today. (i) The positive tendency. We encounter this above all in the unreserved admiration shown for the religious figures who are particularly dear to Christians: Jesus, his mother Mary, the apostles, John the Baptist, Zechariah and so on. This admiration also extends to the Gospel as a book, which was sent down upon Jesus and is acknowledged by the Quran, although of course only in its original text and its authentic, uncorrupted meaning. According to the witness of the Quran there were also, at the time of the Prophet, Christians close to Islam, described as the nearest in love (5:82) and bowing in humility to Allah (3:199; cf. 3:110,113,115; 4:55; 5:66). The Quranic perspective on monks and priests, however, appears to be thoroughly ambivalent (5:82; 24:36-37; 57:27, on the one hand; 9:31,34, on the other). (ii) The negative tendency. This is chiefly concerned with Christian doctrine about God and Jesus. Christians have made Jesus into a God and they call him the Son of God (4:71; 5:17,72; 43:59; 9:30-31); they worship three gods and allege that Jesus was crucified (4:156; cf. 3:55). Furthermore, they take their monks to be their lords in derogation of Allah (9:31). They commit excesses in their religion (4:171) and have separated into sects on the basis of their different views on the person of Jesus (5:14; 19:37; cf. 2:133,145; 3:61). They claim that only Christians can enter Paradise (2:111). They call themselves Gods children and his beloved friends, but God will punish them for their transgressions. The Jews and Christians (the People of the Book) wish they could turn you back to infidelity after you have believed, from selfish envy, after the truth has become manifest to them (2:109; cf. 3:110); and the monks (as well as the Jewish rabbis) devour mens wealth (9:34). This contradictory perspective doubtless reflects the conflicting attitudes of Christians to Muhammad and the Quran: some accepted them while others opposed them. This conflict is reflected in the Quran, so that Christians are at one point reckoned as a privileged group, the People of the Book, and at another point as an accursed group of unbelievers (kuff?r) and of polytheistic idolaters (mushrik?n). It is precisely this ambivalence that has determined the character of Muslim attitudes to Christianity right up to the present. The ways in which Christianity and Christians are judged – whether as unbelievers or as People of the Book and monotheists – thus depend to a considerable extent on the peaceful or tense co-existence of Christians and Muslims, exactly as in the time of the Prophet. 2. The same two-sided perspective is present in Islamic tradition and theology, although they tend to emphasize the negative statements in the Quran. We must keep in mind this twofold inheritance: on the one hand the traditional condemnation of Christian doctrines and moral teachings, often in association with Western neo-colonialism and an allegedly corrupt Western civilization; on the other hand the quite different perspective, also rooted in the Quran, which regards Christianity as one of the three monotheistic (or heavenly) religions, and Christians as brothers and sisters in genuine faith in God (Quran 49:10, as long as Christians are included among the believers mentioned here). (iii) finally, Christianity does not sufficiently respect the transcendence of God, because it considers Jesus to be both human and God at the same time and so also speaks of the participation of human beings in the divine life. Among many other dimensions of Christianity which might have been chosen, two are emphasized in what follows. (i) The term Christian was first applied to followers of Jesus by Gentiles in Antioch (present-day Antakya in South-eastern Turkey) around 43 AD (cf. Acts 11:26). To be a Christian means to believe that Jesus, the prophet from Nazareth, who went about doing good (Acts 10:38) and who died on the cross and rose from the dead, is the Christ (the Messiah), the one who came forth from God as Gods final and definitive self-revelation to human beings. Following the example of Jesus, and in his power, Christians try to live out their relationship to God and other people in harmony with Gods will and in the service of others. The will of God is that we should love all people – who are all called to become Gods children – with the same love; we are called to love both God and our brothers and sisters. Christians believe that Jesus, who died on the cross, was raised from the dead and now shares in the glory of God the Father, is living and present always and everywhere. Jesus brings alive in his own distinctive way an essential feature of the understanding of God in the Old Testament (the Torah): God loves his people with a passionate love, as a mother loves her children (Isaiah 49:14-15; cf. Hosea 11:1-4); as a husband loves his wife, even when she is unfaithful (Hosea 1-3; Ezekiel 16); as a man loves his fiancée (Song of Songs). Jesus reveals the fullness of Gods unconditional love for the human race. This went much further than was imaginable in the time of Jesus, when Gods love was thought to extend only to the Jews and indeed only to the righteous among the Jewish people. This understanding excluded from the kingdom of God not only non-Jews, but also Jews who were considered to be open sinners (such as tax officials), and also those who suffered from contagious illnesses such as leprosy. Jesus turned this understanding of the relationship between God and human beings totally on its head. He proclaimed that God turns to all people with the same love. God, the Father of all people, loves them all without distinction. If it is at all possible to speak of God having a special love for anyone, it would be for those whom society condemns and excludes: open sinners (who repent) and Gentiles: The tax collectors and the prostitutes are going into the kingdom of God ahead of you (Matthew 21:31; cf. 8:10; Luke 7:36-50). This explains why Jesus, acting in accordance with the revelation of God as the universal and merciful Father, was always ready to welcome those, such as the poor and notorious sinners, who turned to him to find a way out of their material or spiritual need. Jesus never rejected anyone, accepting invitations equally from people of high standing and Pharisees as well as from tax collectors and sinners. Was he not criticized for sharing meals with sinners (Matthew 8:10; 11:19; 21:31; 9:10-13; Luke 7:36-50; 15:1-2,7,10; 19:7)? Precisely in this sense, he said that he had come to call not the righteous but sinners (Matthew 9:13; Mark 2:17; Luke 5:32). He was severe with those who were proud of their righteousness and at the same time condemned sinners, the poor and Gentiles (Matthew 23:3,13-36; Luke 11:42-52; 18:9-14), for, he taught, there will be more joy in heaven over one sinner who repents than over ninety-nine righteous persons who need no repentance (Luke 15:7,10). This divine attitude to sinners is presented wonderfully in the parable of the prodigal son (Luke 15:11-32) and in other parables with Gods compassion as their main theme (Luke 13-15). Jesus struggled against everything that divided human beings into the two camps of the virtuous and the sinners. He himself relativized some of the most sacrosanct regulations in the Jewish Law, for example concerning the Sabbath (Matthew 12:8; Mark 2:27; John 5:6) or the restriction of worship to the temple in Jerusalem (John 2:13-17; 4:20-21). For the Sabbath was made for humankind, and not humankind for the Sabbath (Mark 2:27). If the leaders of the Jewish people condemned Jesus to death and pressed for him to be executed by the Romans, this was because he had proclaimed Gods unconditional readiness to forgive and be reconciled. This message raises questions about the very basis of the authority of the leaders of the people. God the Father appeared to be of one mind with these leaders, since he gave a free hand to those who took Jesus to the cross. However, God did not abandon him to the power of death (cf. Acts 2:27), but raised him from the dead, the firstborn of the dead (Colossians 1:18; Acts 26:23; Revelation 1:5) and seated him at his right hand. And of that all of us are witnesses, said Peter (Acts 2:32). So Jesus is truly Lord, endowed with the very authority of God, the God who solemnly confirmed the message of Jesus, the truth of all that he had said about God and about humanity. (iii) This message is the message of boundless love, the love of God who loves all people and invites them all to become his children; the God who makes his sun rise on the evil and the good, and sends rain on the righteous and the unrighteous (Matthew 5:45). (iv) It is thus natural that Jesus declares the commandment to love to be the most important commandment in the Law. You shall love the Lord your God with all your heart, and with all your soul, and with all your mind. . . . You shall love your neighbour as yourself (Matthew 22:37,39). Love for God and love for other people were already linked in the Old Testament (Deuteronomy 6:5; Leviticus 19:18) and Jesus takes this up. He makes it into the new law (John 13:34), not only because for him it serves as the summary of all the Law and the prophets (Matthew 22:40; 7:12; Luke 6:31), but also because through Jesus a new significance will be given to this love for God and neighbour. Instead of returning evil for evil, they should return good for evil (Matthew 5:38-42); they should forgive without measure or limit (Matthew 18:21-22), exactly as God forgives (Matthew 6:12, in the Our Father), and as Jesus forgave those who nailed him to the cross (Luke 23:34). This does not imply being indifferent to what is evil and unjust or even applauding it, but rather forgiving wicked and unjust people, because only forgiveness can liberate people from evil and bring about their reconciliation with God and with each other. This love knows no boundaries, because it is indeed an image of the love of God, who forgives, reconciles and creates peace, and because it consists in the gift of itself to others, to God as well as to neighbours. Love does not seek its own advantage. It consists in the giving away of itself and so also in for-giving: No one has greater love than this, to lay down ones life for ones friends (John 15:13). Finally, Jesus was not content simply to preach about such love; he lived it, and he sacrificed his own life for all people, even for his enemies, whom he forgave on the cross. Only after the death and Resurrection of Jesus did the apostles and the early Christians fully understand that the core of the life and the teaching of Jesus consisted in love, in Gods love for us and our love for God and unlimited love for all people. They went so far as to say that the real test of love for God is love for ones neighbour (1 John 4:20-21, and the whole letter), love that consists not in word or speech, but in truth and action (1 John 3:18). We know love by this, that he laid down his life for us – and we ought to lay down our lives for one another (1 John 3:16). And in fact the early Christians did live out this close community of brotherly love (Acts 2:42-46; 20:7-11). Reflecting on the life and message of Jesus in the light which they received from the Holy Spirit, the apostles finally began to understand: if it was possible for Jesus, in the way that has been described, to reveal so clearly the essence of Gods love and also to live out the perfect response to this love, then this was ultimately possible only because he was Gods Son in a very particular and unique way, sent by the Father to communicate this quality of love. For God is love (1 John 4:8-16) and his love was revealed among us in this way: God sent his only Son into the world so that we might live through him (1 John 4:9). This loving God became flesh and lived among us, and we have seen his glory (John 1:14). Jesus, the Word of God, is the revelation of Gods love because he is his Son. Of course, this revelation of love in and through Jesus must be received by the whole human race and furthermore translated into action, till the end of time, through the power of God, the Holy Spirit, working both in the Church and beyond it. Pauls emphasis is that only the Spirit of God, sent by Jesus after his Resurrection (John 7:37-38; 16:7-15), can make it possible for us to call God our Father (Romans 8:15; Galatians 4:6) and to love him and other people with the same love which we have received from God (1 Thessalonians 4:9; Romans 5:5; 15:30; cf. 1 John 4:7). In his hymn to love Paul holds that every one of our actions receives its value from love, and that without love even the most precious charisms are worthless. (v) The official Christian doctrines, or dogmas, that emerged in the early Christian centuries reflected the significance of Jesus Christ as this was elaborated in arguments with the chief religious and philosophical currents of that time. They sought to defend the faith of the New Testament in a changed context. (vi) Christianity therefore means following the way of love, whose source is God himself (1 John 4:7) and who is revealed to us in Jesus, the Son of the Father, in his preaching and also in his life, death and Resurrection. The Church of Christ is based on this love; this love is the source of its life. The exercise of authority in the Church is in the first place a form of service of the community of the disciples of Jesus, following the model of the love which lives in Gods very self. The exercise of this authority consequently demands love for Jesus that is prepared to show itself in costly service (cf. Jesus dialogue with Peter at John 21:15-17: Do you love me? . . . . Feed my sheep.) However, this community of love among Christians should of course never become narcissistic, directed only inwards. It is essentially witness, so that the world may believe (John 17:21). It is a duty for every single Christian, as well as for the Christian community as a whole, to be witnesses to love in the world, committed to justice, reconciliation and peace. This is a high ideal, scarcely ever fully realized in practice, but one towards which all Christians must continually aspire, according to the measure of the gifts they have received. In the course of history, unfortunately, Christians in general and the Church in particular have repeatedly failed to be faithful to this ideal; this sad and regrettable reality must be recognized honestly.78 Nevertheless, the good news of Jesus continues to be present and active, today as yesterday. It presses the Church to live by the law of this love and to work for it to be more widely spread in the world, tearing down every barrier – racial, social or religious – that divides human beings, struggling against the root sins of selfishness and hatred. Every Christian is called by Christ to be unconditionally committed to the victory of love. To maintain that love for God and for neighbour is the central and essential commandment of Christianity does not mean that other religions, and Islam in particular, are simply unaware of this twofold commandment, or that it is only truly Christians who are concerned about love and live lives empowered by love. There is in fact a way of love in Islam, practised by many Muslims, normally without reference to the teaching of Jesus or Christianity. (i) There are only a few verses in the Quran which speak explicitly of the love of God, whether the love of God for human beings (God as al-wad?d – full of loving-kindness [11:90; 85:14]; God who casts his love [mahabba] on Moses [20:39]) or the love of human beings for God (four references at 2:165; 3:31; 5:54). There is also a verse which speaks of a mutuality in love between God and believers, referring to a people whom he loves and who love him (5:54); this is in the context of jihad, here understood as physical struggle against the unbelievers, a holy war. However, on the basis of these Quranic verses we cannot say that the love of God for human beings and of human beings for God is a central theme of Islam. The one and only God, the just and merciful judge, is the centre of the Quranic message. Love is, however, a theme in the Quran and Hadith and also in the teaching of classical Islam, providing both content and terminology for the spiritual tradition within Islam to draw upon. (ii) This spiritual tradition is principally that of the Muslim mystics, the Sufis. Starting with the remarkable R?bia in the 7th century AD, the Sufis made love for God (rather than the love of God for human beings) into the central axis of their search for God. The great Sufis of the early Islamic centuries absorbed this way of love into orthodox Islam, thanks principally to Muhammad al-Ghaz?li (d. 1111), who emphasized that only God is worthy to be loved and who regarded this love (mahabba) as the highpoint and goal of his spiritual quest. Later the ideal of love for God was spread through the whole Muslim world by the religious brotherhoods. It became an important theme for meditation and was entirely accepted by official Islam. This love of human beings for God, as distinct from the love of God for human beings, bears typically Islamic characteristics. For love is seen as a longing for something that is lacking, and the God of Islamic faith is quite free of such dependence. In Muslim understanding, love is a longing for God, a longing to come nearer to him; any idea of loving union between God and human beings is, however, strictly excluded. Finally, this love for God can also demand love for our neighbour, but it is not at all the case that love for created beings can or should be placed on the same level with love for the Creator. Many Muslim mystics, including R?bi?a and al-Ghaz?l?, were of the view that to dedicate oneself totally to God it is necessary to distance oneself as far as possible from all created things. (i) For believers, Christian or Muslim, human beings are the creation of Gods hand, formed after his likeness and destined to return to him. This is the fundamental calling of the individual, of the human race, and indeed of the whole creation, which longs for liberation from every form of oppression, in order finally to enter into Gods glory (Romans 8:19-25; Quran 81; 82; 99; 101). This shared calling establishes a basic likeness between all people, transcending differences of race, social standing and religion. 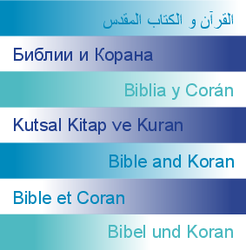 (ii) The position held by the Quran within the structure of the Islamic faith corresponds to that held in Christianity by the person of Jesus himself, the Word of God. Christianity thus offers primarily not teaching but a way, the way of discipleship of Jesus. Every person is called to become Gods adoptive son or daughter in Jesus Christ (Ephesians 1:5). Between the Creator and his creation reciprocal love holds sway. The Creator is Father; human beings are his children. The intimacy of this relationship is far greater than that between servant (abd) and Lord (rabb). The Christian is called to love God and all people because all people are brothers and sisters of Jesus and children of the same Father. Loving God and other people is the only real way to attain human fulfilment. This goes far beyond the natural love between people, for Jesus demands that we should not return evil for evil but rather persist in forgiving and even loving our enemies. Nobody is capable of such love in his or her own strength. Rather, it is a gift from God, whose gift consists in enabling us to love our brothers and sisters as he himself loves them. Jesus himself lived this message out to the point of dying on the cross. To reject faith in this God – whatever the personal explanations for such a rejection might be – is to deprive human beings of their ultimate meaning. (iii) The kingdom of God was proclaimed by Jesus and is in one sense already a present reality; however, it also remains a destination not yet reached, a promise not yet fulfilled in its entirety. Human fulfilment in this world will never be perfectly realized. Hope for total fulfilment is the great energy that drives the human race forward. Progress, in every sense, always remains a possibility till the end of time and, on the individual level, till death. For many, death is seen as proof of the vanity and meaninglessness of human life, but for the believer the death of Jesus on the cross opens the way to his Resurrection and that of all people. He transforms death into victory over death. The end of human life and the end of the world on the last day open the way to eternal life, to its final fulfilment. Then every person will see God face to face in the new heaven and the new earth. There humanity and the whole creation will discover their final and perfect consummation (Romans 8:22-23). (iv) The value of human beings rests on the fact that they have been created in the image of God (Genesis 1:26-27, quoted in 1 Corinthians 11:7; Colossians 3:10; James 3:9) and in the image of Christ (John 1:3; Romans 8:29; 1 Corinthians 8:6; Colossians 1:16; Hebrews 1:2). The human person should therefore never become a means to an end. His or her rights must be respected by every kind of authority, whether secular, religious, social or political. But the human person can only find fulfilment within a community of free and independent persons. The family and other forms of human community therefore play indispensable roles at both national and international levels. The rights of the individual and of communities must therefore be balanced in carefully weighted relationships. Human communities, secular and religious, serve the common good to the extent that they value the individual person. Christianity is not the only religion that claims to offer a comprehensive vision of humanity, its origins and its destiny. Islam makes a similar claim. Muslim and Christian humanism have much in common. However, insofar as Christian humanism has its centre in Christ and Muslim humanism in the Quran, there are essential differences of emphasis. The Quran teaches that God created Adam with his hands (38:75), forming him from clay (7:12; cf. 23:12; 32:7); the creation of human beings from the males sperm is also often mentioned (22:5; 32:8; 80:19). God also breathed his spirit into Adam (15:29; 32:9; 38:72). A famous hadith, reported by Ibn Hanbal, teaches, in terms very similar to Genesis 1:26, that God created Adam in His image (?al? s?ratih). The human race was created to worship the one God, to serve him, to obey him, to praise him and to thank him (4:1; 51:56; 3:190-191; 7:172; 30:17-18). He is a mortal creature (bashar) and is often rebellious. Nevertheless, he is charged with bearing witness to the one God (7:172-173). Those who reject faith in the one God are to be compared to animals (25:44; 8:55). Human beings have a higher status. Only to Adam did God reveal the names of all the animals – something which even the angels did not know (2:31-33). God therefore commanded the angels to prostrate themselves before Adam immediately after his creation. Only Satan (Ibl?s) refused to do this (15:31; 18:50; 19:44; 20:116; 38:74). The human race is to rule the created world, which God has made subservient to his command and his use (14:32-33; 16:12-14; 22:65). He is Gods vicegerent on earth (2:30), a phrase often cited by modern authors advocating a Muslim humanism.